Dragon Quest V: Hand of the Heavenly Bride (ドラゴンクエストV 天空の花嫁, Doragon Kuesuto Faibu Tenkū no Hanayome?, lit. "Dragon Quest V: The Heavenly Bride"), known as Dragon Quest: The Hand of the Heavenly Bride in Europe, is a RPG and the fifth installment in the Dragon Quest series. Originally developed by Chunsoft and published by Enix Corporation, Dragon Quest V was the first title in the series to be released for the Super Famicom in Japan on September 27, 1992. It has since been remade for the PlayStation 2 in 2004; which was developed by ArtePiazza and Matrix Software, and published by Square Enix only in Japan. Another remake was made for the Nintendo DS, and was released on July 17, 2008 in Japan. The remake was also released in North America and Europe, marking the first time the game had an official release in either territory. The game was released on February 17, 2009 for the North American market. A version of the game for Android and iOS has been announced for release in Japan in winter 2013. Along with Dragon Quest VI: Realms of Revelation, the original Super Famicom release never reached North America. In the absence of an official translation, several fan translations were created between 1998 and 2002, followed by a more recent fan translation of the PlayStation 2 remake. Dragon Quest V takes place over roughly thirty years of the main character's life, from when he is born through to when he gets married and has a family. The title introduced a gameplay dynamic in which monsters from random encounters may offer to join the player's party. This concept was used in later Dragon Quest games, and in the Dragon Quest Monsters series constituted the primary way to form a party. The game's monster-collecting concept has since become influential, appearing in many later franchises such as Pokémon, Digimon and Dokapon. In turn, the concept of collecting everything in a game, in the form of achievements or similar rewards, has since become a common trend in video games. 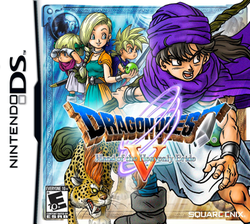 Dragon Quest V has also been credited as the first known video game to feature a playable pregnancy, a concept that has since appeared in later games such as Harvest Moon, The Sims 2 and Fable II. Dragon Quest V is set years after the Zenithian Hero defeated Psaro in the previous installment, Dragon Quest IV. The game starts at Littlehaven, with the Hero leaving to go to Whealbrook. Like all other Dragon Quest games, this one takes place in a medieval world, with no real modern technology, such as cars or electricity. Characters fight with swords, clubs, and magic instead of guns or other weapons. The layout of the world is similar to the layout in Dragon Quest IV, but with a new set of locations, and considerable geographic alteration. The Tower of Heaven and Castle Zenithia are the only surviving locations from the previous game, and they have fallen into ruin and are no longer connected. The overworld has different monster encounter tables for each of the three eras. The quest takes the Hero and his party to many exotic locations, such as a fairy village, a mansion made of ice, several caves, and a volcano. The party eventually makes its way to the castle Zenithia, which is a castle in each game of the Zenithia trilogy. Like a few other Dragon Quest games, the final enemies reside in a dark world, separate from the main map. This page was last edited on 15 February 2017, at 22:33.